Next to the village of Hatsi, Karabakh. Interesting little ruined monastery with khachkars. Complex Bri Yeghtsi consists of four churches, a vestibule, three bays with khachkars, a collapsed chapel, destroyed subsidiary buildings and a large cemetery, mostly created in developed medieval period and rebuilt in following ages. The first church, which is situated in south-eastern side of the hill's top has quite small sizes (5,85x3,6m) and is built from untrimmed stone (except for the western facade). It's a one-nave hall with vaulted cover and an only entry rom west. The construction has almost fully-preserved. In decorative point stands out only the facade, partly the casings of doors, covered with braided stones with crosses inside them, and a half-round stone-tympanum with chess pattern. The second church joins the first one from eastern side. It's also a small building, built from whitish chipped stone, already quite weather-beaten. As the first one it presents a one-nave basilica with rectangular scheme (3x5m). The plaster of the church has almost completely come out and are very well seen the horizontal equal rows of the pointed vault. The floor of the only eastern apside is on one level with the praying-hall floor, i.e. there is no alter-rising in here. Vestries are missing, only in altar-corners there are deepenings. One of the window-passages, placed above the entry, is covered with the arch of the later on pre-wall vestibule. As we see, these two churches, though the distinguishing features have certain likeness in stylistic point. the vestibule joins the western facades of both of the churches and is common for them. This interesting architectural construction is considered one of teh best among analogous ones. In vestibule Bri Yeghtsi, as in other analogous constructions, one can't avoid paying attention to mutually-crossing four arches of the one interior space, and also on laconicism and clearness of architectural forms. In short, the vestibule, especially its leaning on arches vault is the important achievement of Armenian architectural art of XII- XIIIcc. Built in the western parts of the churches the vestibule partly hides their ornamented facades and by it not only contrasts by its monumentality with the rich decoration of both of the churches, but also outlines the ostentation and impressiveness of their portals. The vestibule-gavit has almost a square scheme (7,5 x 7,8). Like the other vestibules it served also as a burial-vault and a place of wordly and religious gatherings. Such functional assignment definitely influenced on the whole composition, conditioning restriction of decoration and interior forms. For creating a larger interior space the architect boldly made longer the tall arches, fixing them to the pre-wall pylons of side-walls. the small architectural forms; khachkars, gravestones, ornamented stone placed only in eastern part of the vestibule in large bays, fromed sith arches. The flatness of vestibule-belfry's walls (except for the western one) by means of pilasters and arches is divided into three large arched bays, the middle one of which is wider then the others. On the western wall of the vestibule there are no pre-wall pylons and the arches here directly lean on walls. By means of crossed over the pre-wall pylons arches the vestibule is divided into 8 parts, covered with a wide vault. Over the eight-hedral light passage, placed in the central part of the vault, existed a rotunda- belfry, about which evidence remainders of pillars and their basis on the roof in the corners of the light-passage. The four-side roof of the vestibule monumentally rises over the gable roofs of the churches. In the interior of the vestibule, in the bays of the eastern wall are put six wonderful khachkars, numerous gravestones with decorations and domestic relieves. By the entry to the southern church there is a richly-ornamented gravestone, on which is carved: "Tomb of sir Hovanes, Karapt's on. In the summer of 1247 (1798)". On both khachkars is pictured a figure in national clothes. The third church is situated on teh highest part of the hill, in 4km towards west from the vestibule. It's a one-nave basilica with a pointed vault, a stage in eastern part and bays by its two sides. The floor of the rectangular hall (interior sizes 2,6 x 4,8m) is covered with gravestones. In decorative point stands out the richly-ornamented western facade. The casings of the main portal are wonderfully decorated. On the half-round tympanum there is a composition, consisting of a cross and rhombs around it. In the upper corners of the portal there are relief images of birds with broken heads. The rest of the wall-surface is covered with sculptured crosses. Next to the bird's picture in northern side there is a gravestone put in the wall. "Remember in your prayers to Jesus Christ Khachenik- The architect of the sacred church". 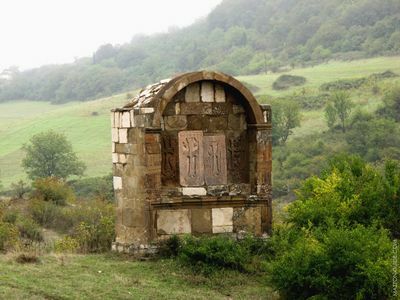 On another stone, placed in the praying-hall is carved "In the summer of 719 (1270)...during Nerses' Bishopy I, Mkhitar, son of Kh... built this cross"> Architect Khachenik, whose name is mentioned in the inscription also built a large beautiful bay with khachkars, placed in southern slope of this hill, by the road. The front part of the stall is destroyed, below, as evidences S.Barkhudaryan, hwo has examined this complex in 1961, ahs preserved a row of eight stones, on which was carved an inscription, consisting of six long lines. "Built by architect Khachenik this monument" wrote S. Barkhudaryan, "is one of the best examples of spread in XIIc analogous monuments, and belongs to the number of most remarkable one from the ones, which we chanced to see". The monumental bay, covered from four sides with trimmed stones is placed on a high, quite destroyed pedestal. The preserved surface- stones of the pedestal are covered with diamond-shaped ornaments. In the bay are put 4 khachkars with beautiful carving, which is unfortunately harmed and rubbed off. Towards south from the complex, by the foot of the hill around the village is the Fourth church, which is the smallest one and is built from roughly-trimmed stone. The cover of the church has collapsed. 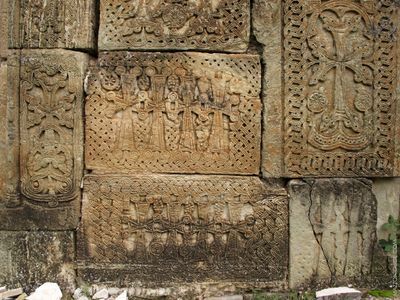 The western facade is decorated with tens of khachkars of various sizes. The only entry in the western side has ornamented framing. The half-round tympanum has especially interesting solution. The composition here consists of a cross on chess back-ground and peacocks, one in each side. In the top western corner of the wall is carved the building inscription in 5 lines. The stones with first-letter lines of the inscription are missing, in the other, quite harmed part it tells that the church was built in the time of catholicos of Aghvank Hovanes and his younger brother catholicos Nerses, i.e. before 1235. Next to this inscription remains also the memorable inscription of the architect: "Remember (in prayers) to God, Shahen- the architect of this church". "So in construction of Bri Yeghtsi complex participated two archtects: one of them Khachenik Anetsi built the church and the bay with khachkars, and Shahen built the church. The stylistic and building likeness of other half-destroyed monuments with constructions of these masters let us suppose, that they too are the creations of the mentioned architects, while the preserved dates and names (Bishop Nerses, prince Smbat) on the walls of the churches are the contemporaries of constructions of Khachenik and Shehen". What concerns the other monuments, which Makar Barkhudaryants calls bems, are actually simply bays, surrounded from three sides with sommon walls and khachkars on the western surface. The analogous bays, built in XIIIc, have preserved also in Hadrut and Bank. Two bays with khachkars are placed in a row, a little above the fourth church. As by separate building details so by decoration they very much resemble one other and have the same sizes (height 3,5, didth- 3,22, depth- 1,85M). In each bay from western side are put four khachkars. The third analogous monument is in the side of the cemetery. But with time all the ornaments and inscriptions in this bay have rubbed off and the face-stones have fallen down. In the cemetery there are numerous interesting gravestones with inscriptions and domestic relieves. This page was last edited on 25 October 2011, at 13:44.